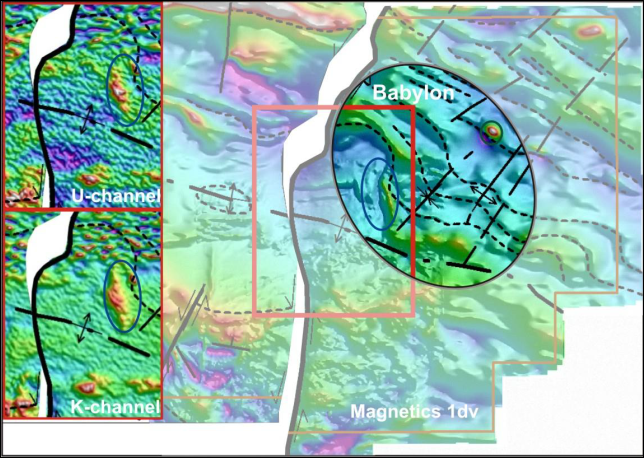 The Babylon Project is located east of the Tollu fault zone (Figure 1). At this location there is a distinct change in stratigraphy across the fault, both strike-slip and dip-slip. The dip slip movement is inferred by the significant thickness change of the porphyritic rhyolite unit (P_-TLs-frp). This increase in thickness may also be due to post-faulting gentle folding (possible with north-east striking fold axis). Ultimately, there is a lot unresolved about the stratigraphy. 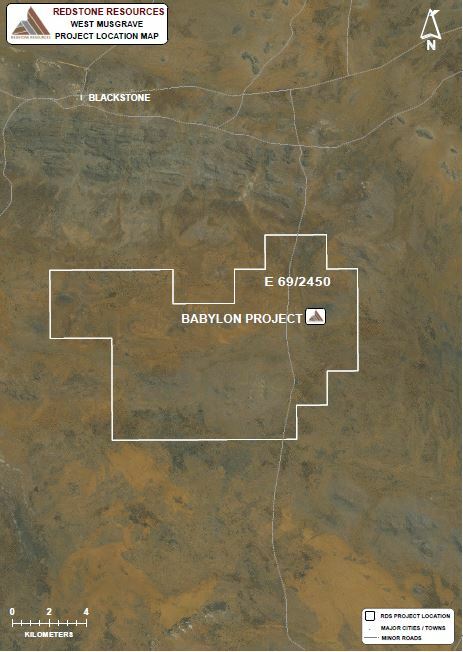 The Babylon Project is prospective for both IOCG and Mt Isa style-copper sediment-hosted deposits. Another feature which is suggestive of an IOCG system is a set of complementary geophysical anomalies (Figure 2). A north-south striking magnetic high is observed at 440,500m E; 7,112,000m N. Encompassing this is K-Th-U radiometric anomalies. The K-channel anomaly is distinct. It is possible this reflects changing stratigraphy from rhyolite-magnetised basalt/mafic sill/rhyolite and the orientation is due to deformation. However, if this occurs then the deformationis distinctly different to the surrounding region and is probably caused by a late antiformal fold. An alternative theory for this geophysical feature is that it represents a hydrothermal alteration footprint. Interestingly, this footprint is visible from google earth. Recent mapping could not detect any overland flow (rain water run-off) at this location suggesting the K-Channel is detecting subcrop or weathering product of Proterozoic sequence. Copper has been observed in subcropping quartz at 440,102 mE, 7,111,594 mN. Figure 2 – Illustrated in this image is the magnetics (1dv) offset along strike by the Tollu Fault Zone. This indication fault bends and corresponding dilation zones within the inferred transform structure. The Stratigraphy (dashed lines), normally east-west, bends to north-south in an irregular nature at the Babylon Project. Antiforms have been interpreted. Also a magnetic zone (blue ellipse) is identify within the corresponding K-channel and U-channel anomalies shown. A bull-eye magnetic anomaly is also identified (green circle).